EDGAR® Online serves as the reporting engine for financial and regulatory filings for companies worldwide. This puts us in a unique position of having a huge repository of financial and company data. 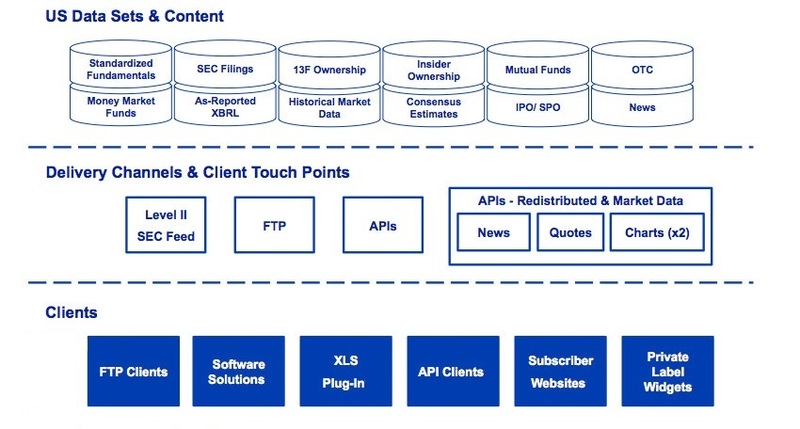 Financial statements, annual and quarterly filings, disclosures, initial and secondary public offering details, money market holdings, XBRL-tagged and as-reported summaries in its raw form is just data, but through EDGAR Online content subscriptions the data becomes a wealth of insight to drive your business decisions. plus an ongoing stream of updates and more. If the information resides in an SEC filing, it's likely available as a configurable EDGAR Online Data Content Solution. EDGAR Online offers the following data – or to build the data that you want, click here. EDGAR Online has a comprehensive process from data collection to support and delivery and delivers high quality products clients rely on as a trusted source and partner. EDGAR Online delivers information products via online subscriptions and data licenses, embedded in other websites and through redistributors. EDGAR Online supports a number of delivery channels for clients to access the various data sets we build – options include FTP delivery or API. With data available in a flexible, well-defined and easy to access structure, it reduces both cost and time of implementation. With web, cloud, social media and mobile channels, information is being created and shared globally at a pace that accelerates daily. Your ability to actively manage risk depends on your capability to quickly collect and analyze the data that impacts your business. From the financial viability of potential acquisitions, to probable weaknesses in your supply chain partners, to the state of your competitive landscape, an EDGAR Online Enterprise Content subscription provides you and your employees with on-demand access to the information necessary to proactively identify and manage risk, make better business decisions and gain insights into potential new opportunities. Most people have heard of EDGAR Online because of the data we provide to Yahoo! Finance and NASDAQ. As a content aggregator, your clients rely on you as their source for timely and accurate information. The greater the breadth and depth of content you provide them, the more of their mindshare and loyalty you capture – and ultimately the more revenue you generate. An EDGAR Online Aggregator content subscription ensures you are streaming the most up-to-date data fresh from the sources that created it, aggregated and formatted and ready for consumption. In the age of big data, EDGAR Online is at the hub of the business information value chain. Contact us to find out how you can become an EDGAR Online content subscriber.